The Heart Dies Last is nothing overly complicated. We're introduced to Julien Lapierre as he's touting his new book, which is up for the top award in Canada. 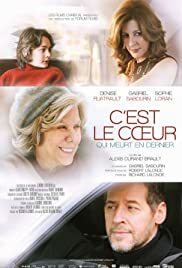 Slowly, the story reveals the inspiration for the book, and the main driving force, Julien's relationship with his mother, who is hospitalized as she's slowly succumbing to dementia. Technically, story-wise, and acting are all pulled off quite well, with nothing to really complain about. The only downside to the movie is that it can be a little slow at times, and drag out. The movie does use flashbacks to show what it was like for Julien as a kid, but these don't have the impact they're meant to, and are an abrupt break from the timeframe of the movie.